Melfa, Virginia – For immediate release. The Eastern Shore Resource Conservation and Development Council (ES RC&D) and the Eastern Shore Watersheds Roundtable are pleased to present the Third Annual Earth Day Celebration in Exmore’s Town Park. This event will take place rain or shine and will provide a wealth of free fun activities for the entire family. Pony rides for children will be available for a nominal donation. 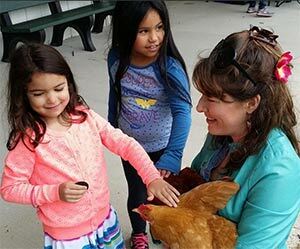 What: ♦ Meet local farmers and their barnyard animals! ♦ Face painting ♦ Antique tractors ♦ …and much more! There will be plenty of hands-on Earth Day related nature and conservation exhibits provided by ES Roundtable Members and local community organizations. A-NPDC, Peninsula Tractor Organization, Eastern Shore Master Naturalists, Turtle Pace Farm, Eastern Shore of Virginia National Wildlife Refuge, Kiptopeke State Park, Eastern Shore Soil and Water Conservation District, Virginia Eastern Shorekeeper, Shine and Rise Farm, Eastern Shore Coalition Against Domestic Violence, Citizens to Expand ESVA Voter Registration, Eastern Shore Beekeepers Club, and more.